Many tourists can’t help but throw themselves head-first into shopping while in Vietnam. Why? Probably the variety of quality goods and the tempting prices have a lot to do with it. Many low-budget travelers considered Vietnam a heavenly place because in many shopping situations they can bargain the prices down to as much as a third of the original cost. The list of Vietnamese bargains is seemingly endless and features bespoke tailoring and the national dress, the ‘ao dai’ from high-quality silk and many other types of material and textiles while many shoppers cannot get enough of the local handicraft, art and jewelry. What to Buy in Vietnam? Traditional conical Vietnamese hats can be found everywhere, as well as such unique gifts as slippers, shoes, and handbags made from traditional materials like silk and bamboo. For those who love handicrafts, it is easy to find beautiful items such as lacquer ware, vases, trays, rosewood boxes, wood-block prints, oil or watercolor paintings, blinds made from bamboo, reed mats, carpets, ceramics and leather work. For more valuable items such as art, antiques and jewelry, you should know that some of these are subject to regulations governing the export of antiques. Ask the dealer about this. 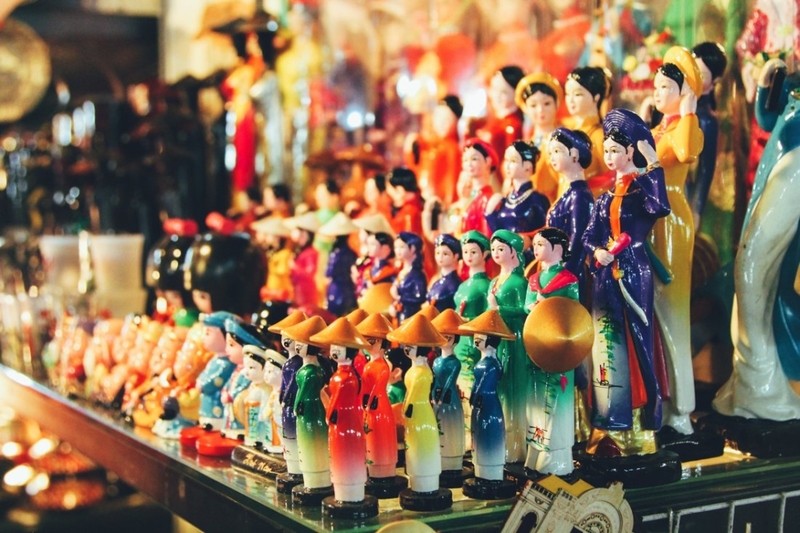 Also, when buying really expensive items, get an expert to certify whether the item you plan to buy is a genuine antique or an imitation; copy “antiques” are not uncommon in the Vietnamese market. As for jewellery, although Vietnam is rich in gemstones, this does not mean they are cheap, so be suspicious of “special” deals. It is wise to shop for such items only at highly recommended outlets – the last thing you need is to pay large sums for coloured glass. Experienced visitors to Vietnam recommend always driving a hard bargain when shopping in this country. Hard does not mean aggressive, however. The trick is to bargain with a smile and to be polite – this way, you will probably get what you want at a price with which you and the dealer are both happy. If you have time to spare, it is always wise to compare products and prices; don’t just buy the first item you see in the first shop. Many people will also tell you that buying from street vendors is cheaper than buying in malls or markets, but this is not always the case, so shop around. It is better to take your time and enjoy searching for good Vietnamese souvenirs and gifts for your family and friends.